Just moments from Montreal's vibrant business district and the Central train station, the Residence Inn Montreal Downtown boasts a prime location, and serves as the ideal base from which to explore the Golden Square Mile in true modern style. Beautifully appointed suites offer plenty of room to relax, and come equipped with full kitchens, ergonomic workspaces and comfortable beds. The hotel features a fitness center. 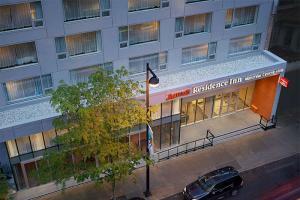 Approximately 14 miles from Montreal-Pierre Elliott Trudeau International Airport. Peel subway station is .1 miles south of the hotel, and Central Station is just over half a mile away.